Learn the secrets of bunting and hitting for young players from one of the top softball coaches in the country. During her extraordinary tenure on the bruins coaching staff, UCLA has played in a record 18 championship games winning 10 titles -- including the 2003 and 2004 championships. (Last year and in 2002 they were runners-up). Learn from her as Coach Enquist explains and shows an effective and time-efficient method for teaching younger softball players the proper way to bunt and hit. In an easy-to-understand and apply manner, the video reviews the key components of sound hitting and offers game-tested drills for developing each element. Covers the bunting game, three swing phases, hitting mechanics, hitting progressions, common hitting problems, one-arm drill work, tee work, contact point and rhythm, and self-toss drills in this 56 minute video. 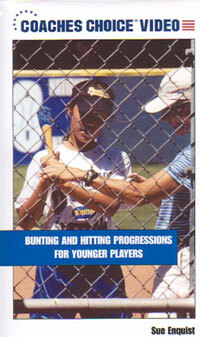 This video tape was produced in 2003 (sorry, no DVD at this time) right after winning the championship, so get the video today and teach your player and team proper bunting and hitting for young players to help them enjoy the game more and win more games. Get all of Coach Enquist's coaching knowlege about coaching kids and save $20 in the process! She has created 2 other tapes's on coaching youth players.